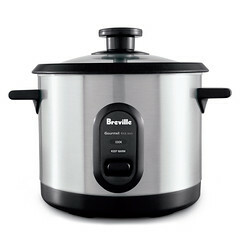 The Breville Gourmet Rice Duo 10: Stylish brushed stainless steel rice cooker makes up to 20 cups of perfectly steamed rice. Spring-activated auto-off ensures perfect rice. 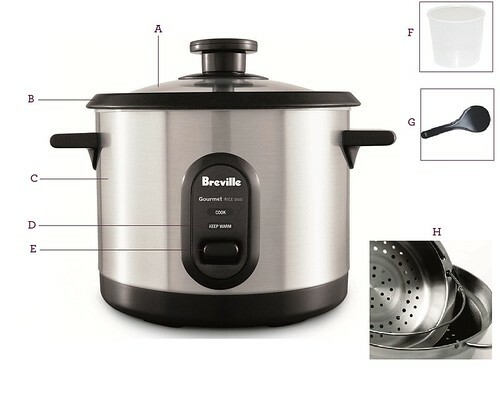 Smart Warm function automatically keeps food at ideal temperature. The stainless steel steaming baskets and tempered-glass lid allow you to steam seafood, poultry, or vegetables simultaneously with your rice. A. Cook 'n' Look glass Lid. B. Large 10 cup Removable Cooking Bowl. C. Stainless Steel Housing. D. 'Cook' and 'Keep Warm' Indicator Lights. E. Selector Control with 'ready bell' and automatic 'keep warm'. F. Measuring Cup. G. Serving Spoon. H. Stainless Steel Steaming Trays.